This is a Spanish classic dish that comes from an Italian classic one. In fact when Spanish people say they will 'cook pasta' this is what they normally refer to. My grandma went as far as boiling the pasta in the tomato sauce itself - I thought my Italian friends would be horrified to hear this, but I have found out that in the old times this is how pasta was prepared in some parts of Italy. Children love this dish, no mater the age. Boil the pasta in the water (with salt) following the packet instructions and drain the water out of it. Mix it with the tomato sauce. Separately fry lightly the chorizo (without oil) for 2-3- minutes or alternatively put it in the highest setting of your microwave oven for 45 seconds. 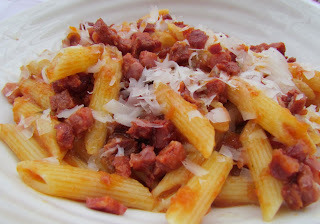 Discard the (considerable amount of) fat that oozes from the chorizo and mix it with the pasta. Add grated cheese on top.